4. Do HPV Vaccines Increase the Risk of Precancerous Lesions? Nutrition Can Save America! This eye-opening report explains how and why America can be saved from collapse by unleashing the healing power of nutrition. The Five Best Anti-Viral Products to Beat Influenza, Swine Flu, Bird Flu and SARS: The best free report you'll find on the 'net, complete with trusted, independent anti-viral product recommendations. The 7 Principles of Mindful Wealth teaches you how to break through wealth attraction limitations and embrace the level of abundant financial wealth you truly deserve. Breast Cancer Deception reveals the shocking truth about the breast cancer industry's scheme to profit from disease and censor natural cures. Exclusive interview with Jay Robb covers the philosophy and innovative products of this health & fitness champion. The Amazon Herb Company: An Independent Review brings you the latest news about the fast-growing Amazon Herb Company and its remarkable success in healing people and the planet at the same time. The pH Nutrition Guide to Acid / Alkaline Balance by Jack Challem. Reveals secrets to "alkalizing" your body chemistry to prevent disease and accelerate healing. Medicine From Fish: How to heal degenerative disease with a unique medicinal protein. The FDA news release of March 31, 2003 acknowledges that "most infections (by HPV) are short-lived and not associated with cervical cancer", in recognition of the advances in medical science and technology since 1988. In other words, since 2003 the scientific staff of the FDA no longer considers HPV infection to be a high-risk disease when writing educational materials for the general public whereas the regulatory arm of the agency is still bound by the old classification scheme that had placed HPV test as a test to stratify risk for cervical cancer in regulating the industry. In other words, the FDA knew in 2003 that HPV infections are not associated with cervical cancer. Furthermore, the FDA states, in the same press release, "Most women who become infected with HPV are able to eradicate the virus and suffer no apparent long-term consequences to their health." In other words, HPV infections do not cause cervical cancer! Remember, the entire push for mandatory HPV vaccinations of young girls across the country has been the urgent call to "save" these young girls from cervical cancer. The vaccine push has been about "savings lives." But as these documents clearly reveal, HPV is no threat to the lives of young girls. In fact, as you will see below, HPV infections are naturally self-limiting! As the reclassification petition reveals, HPV infections are naturally self-limiting -- meaning that they are controlled naturally, without requiring intervention with drugs or vaccines. It is not the HPV virus itself that causes cervical cancer but rather a persistent state of ill-health on the part of the patient that makes her vulnerable to persistent infections. "Based on new scientific information published in the past 15 years, it is now generally agreed that identifying and typing HPV infection does not bear a direct relationship to stratification of the risk for cervical cancer . Most acute infections caused by HPV are self-limiting [1, 4-7]. ...Repeated sequential transient HPV infections, even when caused by "high-risk" HPVs, are characteristically not associated with high risk of developing squamous intraepithelial lesions, a precursor of cervical cancer. A woman found to be positive for the same strain (genotype) of HPV on repeated testing is highly likely suffering from a persistent HPV infection and is considered to be at high risk of developing precancerous intraepithelial lesions in the cervix . It is the persistent infection, not the virus, that determines the cancer risk." The FDA agrees with this assessment of the relationship between HPV and cervical cancer, as evidenced by its 2003 news release quoted above. 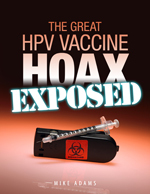 Next, we reveal evidence that HPV vaccines actually cause precancerous lesions in women.